A computer with Adobe Acrobat Reader DC installed is required to open and fill the Application form. If you don’t have Adobe Reader on your computer, you can download it for free here. Adobe may suggest installing software from other companies along with Reader. Usually you do not want or need those, so uncheck them unless you’re sure you want them. If you use PDF products apart from Adobe Reader DC, e.g. Adobe Pro, the form may not be fully functional. You will be emailed an Application Form to the email address you provided once your Registration Form has been processed by the SEC. Open the email sent to you by the SEC. Hover your mouse over the attachment and the box will change. Click the down button, highlighted by the red circle. This is the download button. The Application Form has downloaded when you see this box appear in the left hand corner of your screen. Click the up arrow circled in red. 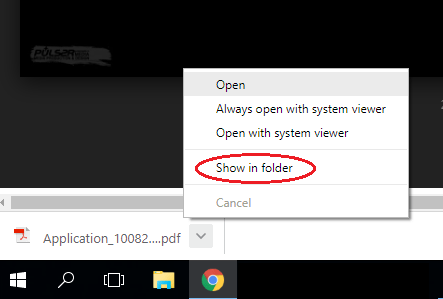 Select ‘show in folder’ circled in red. An Activation Button has been included on the Application Form to ensure your computer is compatible with the Application Form and so that you can submit it successfully once you have filled it in. When you click the Activation Button, you will be asked to input your selected email address (we recommend Gmail). The Application Form is not compatible with Hotmail. Input the activation code into the Application Form and press the enter key on keyboard.“This form is unlocked” will appear. Start filling in the Application Form with your details. Click the symbol beside each section on the form for hints and examples. Ensure that you fill in the Application Form with complete and accurate information as failure to do this will delay processing of your application. Current balance of your savings account, investments, shares, prize bonds etc. Your dependent children as entered by you on your Registration Form have been recorded on our system. Children’s initials and birth month only are included for security reasons. Select your child’s religion from the dropdown list. Select your current employment status. If you have had a change in employment status since 2017 e.g. made redundant, note in comment box and provide a cover letter with your posted application, with figures. The letter should outline your current financial circumstances to allow the SEC office to accurately calculate your means test. Also provide appropriate supporting documents e.g. P45, Social Welfare statement etc. e.g. Nurse, Farmer, Artist etc. If your children are living with you and a partner and your partner is not your children’s biological parent, you must provide your partner’s income details. Provide a cover letter and separation agreement outlining the financial maintenance paid to you by your children’s biological parent or by you to a former partner. If your partner is living and/or working overseas, financial income documents must be provided or your application will be delayed. Provide separation agreement documents showing custody arrangements of all children and financial support agreement. Provide a cover letter with your supporting financial documents outlining the financial support arrangement with the other parent of your children. Enter date of separation in Comments box. Select Single if you are a single unmarried parent raising your children alone without the support of a spouse, civil partner or partner and you are not cohabiting. If Parent 2 is deceased, please provide a photocopy of the death certificate with your supporting documents if you are applying for the first time as a widow/er. Provide divorce agreement documents showing custody arrangements of all children and financial support agreement. Provide separation documents showing any financial maintenance agreement. Enter details and income of new partner. Enter the details of your child’s other parent or the person you are cohabiting with. Enter Income details from your 2017 Form 11 return summary or P21 balancing statement (request from revenue) and P60 in this section. Form 11 for person receiving rent and P21 balancing statement and P60 if other person is PAYE, social welfare statement if other person is unemployed, retired, receives illness benefit, carers benefit etc. All social welfare payments must be entered here. Enter payments made to you by a former partner e.g financial maintenance support, any financial assistance, monetary gifts or donations from family or friends, forestry payments etc. Select ‘None’ if no non-taxable income is received and unnecessary boxes will disappear. Select whether your family home (where you and your children whom the grant is being applied for live) is owned mortgage free, with a mortgage, provided rent free or rented. If you own/rent a property from which you run your primary business e.g. a farm, a crèche etc. enter its details here. All property assets are to be listed including any land (other than your farm/primary business) and holiday homes. Only property/land owned by you in addition to your home and farm/business is to be entered here. If you do not receive rental income from this other property enter €0.01 for Rental Income per Month. Declare all liquid assets including low value savings accounts and prize bonds. List Credit Union loans, credit card, other small loans and overdrafts here only. E.g. You drive one of your children, with a serious illness or condition, from Cork to Crumlin children’s hospital four times a year for a two day hospital stay. You must provide a Doctor’s letter outlining diagnosis or illness or a copy of hospital appointment letters. Additionally, provide petrol costs (use AA Route Planner to calculate). Accommodation costs with receipts. Copy of receipts or online pre-booking receipt for parking. Routine visits to the GP or dentist are not to be included. Please outline in the provided box the financial breakdown of the special circumstance and the total amount in the financial impact box. If you wish to provide additional written information, provide a cover letter. Deduct any costs covered by PRSI or tax back for health expenses or covered by health insurance. For Special Circumstance costs to be included in your means test, supporting documentation with financial figures e.g. receipts must be provided. Letter from a doctor outlining condition must also be accompanied with any expenses incurred. You may provide a bank statement with payments clearly highlighted. To be eligible to apply for the grant you must verify that your child is an active member of a SEC approved Protestant denomination. Type all details including charity number of your child’s minister and church in the red boxes. Included are all documents you may be asked for. Once your online application is received by the SEC office by email and processed you will receive an email with your personal document list, detailing all documents you will need to provide. Read and tick the declaration box. Click Verify, if the form is filled correctly a Submit button will appear. When you click the Submit button a draft email will be created in your email draft folder (should open automatically). If the form is not filled correctly, an error box will appear when you click the Verify button. Check that all red boxes are filled. Enter None for unneeded boxes to disappear. Enter €0.01 instead of €0.00. Click Verify and Submit and follow the above instructions. HomeCost2 – Section D. Family Farm/Business Purchase Cost. Income1/2 – Section C. PAYE gross income OR Form 11 total income. Are both left and right boxes filled? Occupation 1/2 – Section B. Occupation/Profession e.g. Farmer, Nurse, Carer etc. Religion1 – Section A. Select your child’s religion from the dropdown list. Email info@secgrant.ie if your religion is not on the dropdown list. ReligionC3 – Official Address of Protestant Parish, congregation, Quaker meeting etc.